Tobacco addiction (also known as nicotinism) remains a preventable healthcare challenge in the entire world and is the most significant cause of loss pertaining to national and international economy and productivity. Nicotinism poses a significant challenge to the general health and well-being of adolescents, pregnant women, and developing infants. Adolescents are highly vulnerable to nicotine addiction and suffer from poor quality of life, early morbidity, and mortality. Nicotine exposure during intrauterine life can induce diversified embryopathies (such as abortion, stillbirth, sudden infant death syndrome, microcephaly, craniofacial abnormalities, growth retardation, ADHD, autism, and craniofacial abnormalities) in developing infants; likewise, asthma, chronic obstructive pulmonary diseases (COPD), cancer, and infertility can develop in adults. Tobacco smoking kills nearly six million people each year, and almost five million of these deaths are the result of direct tobacco use, while nearly 600,000 are the result of non-smokers being exposed to second-hand smoke. Nearly 80% of the world’s one billion smokers live in low- and middle-income countries. Some tobacco smoking-related health risks include: lung cancer, COPD, cardiovascular diseases, stroke, asthma, reproductive anomalies, premature low birth weight infants, diabetes, blindness, cataracts, macular degeneration, and nearly ten types of cancer, including colon, cervix, liver, stomach and pancreatic cancer. There are roughly 7,000 toxic chemicals in tobacco which can directly or indirectly cause cancer, stroke, and heart attack to induce early morbidity and mortality. At least seventy chemicals have been implicated in inducing cancer. A person’s life span is reduced at least ten years when smoking tobacco. Nicotine is the primary ingredient in tobacco, possessing a highly addictive potential which causes physical tolerance and psychological dependence, with severe withdrawal symptoms and potential for relapse. Chronic smokers find it extremely difficult to quit smoking as the success rate is only 33%. Although several preventive as well as therapeutic measures have been implemented to minimize the risks of numerous illnesses associated with tobacco smoking, a considerable amount of research is needed to further minimize this devastating, yet preventable addiction from the entire world. Recent trends in the reduction of smoking in several countries including the US, Canada, and Australia seems quite encouraging; yet smoking in several other countries such as Serbia, Slovenia, Russia, China, and India remains a significant challenge. Recently, electronic cigarettes (e-cigarettes) emerged as the next generation of nicotine products with different brand names in the market. Although their popularity has increased particularly among adolescents in the Western world, the extent of psychiatric comorbidity with e-cigarettes use and dual use of conventional (combustible) vs e-cigarettes remains uncertain. As many as 460 new brands of e-cigarettes have been introduced. Older brands tend to highlight their merits over conventional (incinerating) cigarettes while newer brands emphasize consumer choice in multiple flavors and product versatility. Public awareness and proper education (particularly for young adolescents) will go a long way in early prevention and successful clinical management of nicotinism. Nova Science Publishers have now released an interesting book in four volumes for learning more about the basic molecular biology, molecular genetics, emerging biotechnology, diseases linked to nicotinism and their possible prevention and cure. 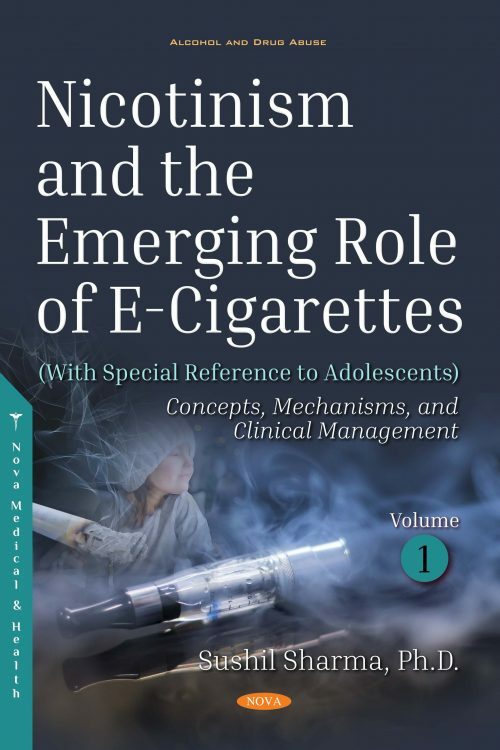 The primary objective is to minimize nicotine-induced early morbidity and mortality due to asthma, emphysema, cancer, heart attack, diabetes, obesity, infertility, major depressive disorders, schizophrenia, Alzheimer’s disease, and several other neurological and neuropsychiatric disorders, which are systematically described in this book. This book presents recent knowledge and wisdom regarding the harmful and therapeutic benefits of tobacco smoking by incineration or by vaping through e-cigarettes. Volume One describes general topics on nicotinism and the emerging role of electronic cigarettes; Volume Two describes the basic molecular biology of nicotinism; Volume Three describes emerging biotechnology in nicotinism; and Volume Four describes chronic diseases associated with nicotinism and charnolopharmacotherapeutics. A novel disease-specific spatiotemporal charnolosomics and conventional omics (genomics, proteomics, metabolomics, lipidomics, and metallomics) with correlative and combinatorial bioinformatics is proposed for the first time to accomplish targeted, safe, and effective personalized theranostics of nicotinism for a better quality of life.